Imagine that when you were 18 years old, you were riding in the back of a pickup truck that got hit by an 18-wheeler. The accident led to both your lower legs being amputated, and you went through years of surgeries. Now you struggle with everyday life. What would you do next? If you were diagnosed with Stage 4 colon cancer and undergoing chemotherapy, what would you do? If you were once a model, then found yourself at 295 pounds wondering what the hell happened to you, what would you do? When you’re 81 years old, and the world expects you to be a in a nursing home, what will you do? 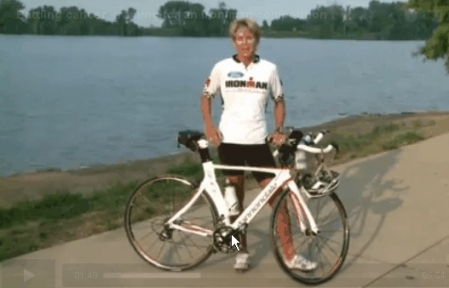 Lew Hollander chose Ironman. Note: he qualified because he won his age division last year! 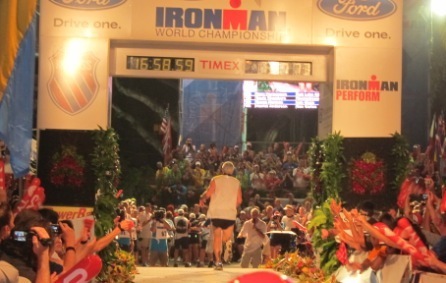 Oh, and he’s competed in Kona 22 times and finished 22 times. Lew is the man! These stories helped create one of the most amazing and inspiring days of my life this past Saturday. 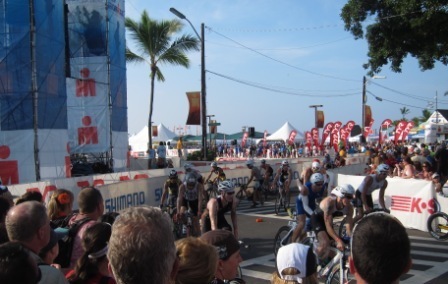 For those not familiar, Kona hosts the Ironman World Championship each October. 2.4 miles of swimming, then 112 miles on a bike out in the brutal sun. And when you’re done with that, you get to run a marathon! Kirsten and I had been looking forward to the race since making the decision to move to Kona in January. We figured it would be great to see some of the most fit people in the world tackle an insanely-difficult day of racing. 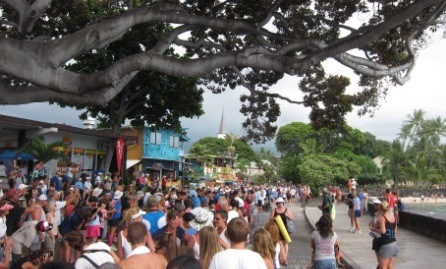 We went down early to see the professionals start at 6:30 am at Kailua pier. Thousands of people down there watching the 100 or so professionals, along with a helicopter overhead filming. There was excitement in the air and a cannon blast signaled the start of a long day. About 1,700 amateurs, or “age-groupers” as they call them, crowded out into the water for their start at 7 am. Once the cannon sounded, this mass of bodies churning was an incredible sight. We watched both groups of swimmers come in and transition to the bikes, which were stored at the pier. At times, they came through in such large numbers that the bikes got backed up while entering the street. It was cool to rattle our cowbells and help launch them out onto that long bike ride. Around 9:00 or so we decided to go home and give the kids a break. This worked out great, as we watched streaming online coverage of the leaders. At 2:00 we went back down to see the top professionals come in and there was a nice, enthusiastic crowd to support them. It’s really amazing to see someone do all 3 events in just over 8 hours. Once we’d had our fill of the pros, we walked over to watch some of the older folks transition from the bike to the run. They had to start the marathon by 5:30 pm or they’d be swept from the course. Many of them were plugging along slowly and several were walking. It was wonderful to see the determination to start this, even after 10 hours of racing. Kirsten then hung out until 6:30 while I took the kids home. She caught many of the age-groupers about 1/3 into the marathon and was impressed by their looks of determination. I came back down at 8 and that’s when the magic began. First off, each finisher gets a special treatment. There’s a long victory lane, flanked by cheering folks. 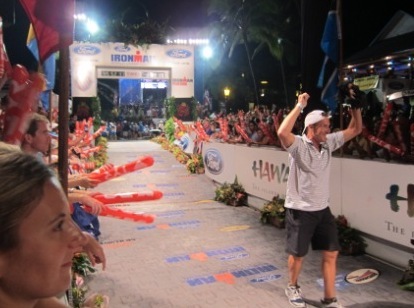 The announcer will call the name of the athlete, often tell a little bit about them, and then proclaim “You are an Ironman!” to much applause. Over the course of the evening, the crowd swelled in size to several thousand people. Several thousand loud, encouraging people. The event hosts did a great job keeping everyone fired up and the energy increased throughout the evening. Because the race cutoff is midnight, the later hours bring more physically-challenged people as well as the urgency to beat the clock. By 10 pm it was a frenzy. A pure, wholehearted, encouraging frenzy. I’ve been to big events like the Stanley Cup Finals and those were insane, but it didn’t have the soul that this night did. There’s no opponent to beat down. Every finisher was a big winner. And all the noise that the crowd poured out served to boost the racers and bring them in. I’m sure the noise could be heard by every runner still out on the course, letting them know we were there for them. Those last 2 hours, everybody coming in was a rock star. Besides the AMAZING folks I detailed above, there was one person who’d tried the lottery for 19 years and finally got a spot. One who entered and didn’t finish 16 years ago, but came back this year to do it. For a little icing on the cake, one guy who pulled out a “Will you marry me?” sign to propose to his girlfriend as he entered the finish corridor. While I’m generally a good soul, this evening still purged so much cynicism and brought in so much love. I cheered with as much passion, volume, and aloha as I possibly could and everyone else there doing the same made it special. Women’s pro winner Chrissy Wellington spent the last 3 hours putting leis on many of the finishers, and many of the earlier finishers joined the crowed to cheer in the final few racers. When Teri Griege came in, she was sobbing, stopping at one point to hug a few team members, then going through the finish and joining additional family and team. When Scott Rigsby came by, pride was in his eyes, and he struck a powerful pose at the finish stripe. If you haven’t watched the video embedded at the top, go back up and do it now. Tara had a look of near disbelief in her eyes – that she was really going to make it. And her mom was there at the finish to greet her. Lew Hollander had a great smile and attitude. While he’s 81, he’s no stranger to these races and seemed to feed off the crowd and enjoy the moment. 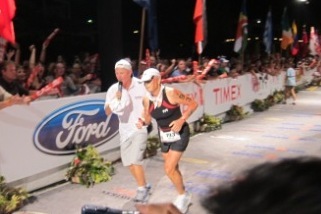 And finally, there are Gayla Chambers and Gary Hermansen, who finished with just over 1 minute left. 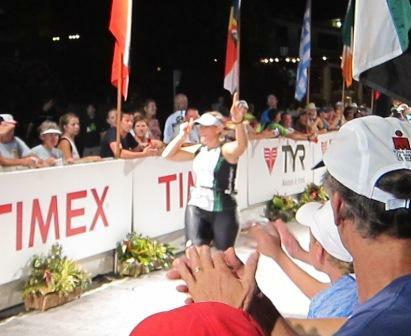 The crowd coaxed each of them all the way into the finish, and after 16 hours and 59 minutes of racing, they can each call themselves an Ironman. Gary Hermansen – Made it with a minute left! It’s amazing what both ordinary and uniquely-challenged folks can accomplish. And what of myself? I still struggle to wrap my head around what I’ve experienced. After a night of seeing these people do so much, I can never look at my own challenges the same way again. I’m not a big believer in phrases like “you can do anything”, as it’s not exactly true. But what is certain is that each of us can accomplish FAR MORE than what we perceive as our own boundaries . I will push my limits. I will dream more. I will do more.